He is a wonderful pug!!! He has had no issues with our 4 dogs and has just made himself at home. He is a snuggler and a lover. He follows us every where. 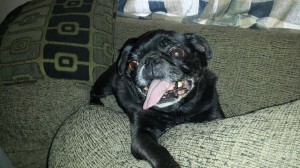 He is definitely ready for adoption events because he is going to make someone a very happy pug owner! I am very impressed with this little guy cuz he had adjusted to ever thing so well.